The Achilles tendon is one of the strongest tendons in the body. This tendon starts at the muscles in the back of the lower leg and is attached to the heel bone. Inflammation of the Achilles tendon is very common. This involves two large groups of patients: the first group includes young, sporty patients that encounter problems, often when they are building up their sporting activities: such as runners (start-to-run) or tennis players at the beginning of the season. The inflammation here is mainly in the membrane surrounding the tendon. The tendon itself does not present any real problems and this is a strain injury. The second group of patients are middle aged and have problems performing moderate sports activities, or even in everyday life such as during work performed standing up or walking. These patients suffer from degeneration (reduced quality) of the tendon. 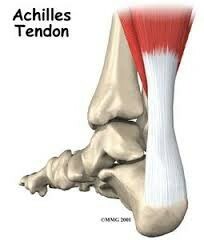 Achilles tendon problems cause pain at the back of the lower leg, and up to the heel in some cases. The pain initially occurs when beginning and after ending any sports activities. The pain is usually less noticeable during the exercise. If the inflammation is more extensive the pain may be constant and sports activities or even walking normally may be extremely painful. A painful thickening can often be felt in the tendon, a few centimetres above the point at which it is attached to the heel. This is more common among older patients with degeneration of the tendon. Clinical examination often reveals the tendon has shortened. The diagnosis is usually very clear from the patient’s account and the examination, and treatment can start without further tests. In some cases, an X-ray will reveal calcification on the muscular insertion of the tendon. An X-ray enables the inflammation around, in front of or in the tendon to be assessed more effectively. If conservative therapy provides no improvement an MRI is the ideal imaging option. This examination provides the best imaging to ascertain the quality of the tendon and the extent of the inflammation and any bursitis or minor tears in the tendon. In the first instance we will try and treat this problem conservatively (non-surgically). For athletes this usually means temporarily halting their sporting activity. Inflammation can be reduced by taking an ice bath or by applying ice to the painful area. Moreover, anti-inflammatory medication (NSAIDs) may be used for a few days. It is important that the tendon is the correct length. Exercises are the cornerstone of the treatment to improve the length of the tendon. You must perform the exercises every day at home in order to obtain good results. A physiotherapist can help you stretch the muscles and to treat acute inflammation. Use of an elevating heel cup in the shoe ensures the tendon is less tense. This also provides shock absorption and can help combat the pain. Another option in the treatment of inflammation in the Achilles tendon is shock wave therapy. It is a non-invasive method that is only used if other conservative treatment is not very successful. Conservative treatment may last a long time before achieving success: three to six months. The longer the patient has been suffering from the complaints, the longer they will last. - Lean forward against a wall, with one knee straight and the other bent. (If both your feet hurt, you should alternate your position to stretch each foot): the painful heel is placed furthest from the wall (with the knee straightened). - When bending forward the straight leg is exercised: you feel the heel and the arch of the foot stretch. You will clearly feel the tension in your calf. - Stretch and hold the position for ten seconds, then relax and stand up straight, and repeat twenty times. Practice the same exercise programme on the other side too if you have problems on both sides. Exercise 2: Lean forward while leaning on a chair or table. - Bend both knees and gently squat. Try and keep your heels on the floor as long as possible while you squat. - You will feel your Achilles tendon and arch of your foot stretch when your heel leaves the floor. When you feel the tension, try and hold the position for ten seconds and then stand up straight. Repeat this exercise twenty times. Exercise 3: Stand on the lowest step of a staircase. - Stand on the lowest step of a staircase and try and balance on the ball of your foot. - Lower your heels very slowly as far as you can, until you feel your calf muscles stretch. - Try and hold this position for ten seconds, and then stand up straight. Repeat this exercise twenty times. If the non-surgical treatment is unsuccessful, an operation may be considered. There are various options depending on the severity of your problem. Arthroscopy: Keyhole surgery can be used to remove extra bone and the bursa on the heel. This procedure is performed via small incisions and the small wounds usually heal faster than with a traditional ‘open’ operation. Naturally a recovery period is necessary after the procedure. However, cast immobilisation is not required and you can walk on the operated foot immediately. Minimally invasive: This means that the tendon sheath is opened up using small incisions, to create more space for the tendon. Naturally a recovery period is also necessary after this procedure. However, cast immobilisation is not required and you can walk on the operated foot immediately. Open release: In this technique the tendon is detached and the inflamed or degenerated tissue is removed. The quality of the remaining tendon tissue determines whether or not a reinforcing stitch is required. You will temporarily need a cast after the operation. Augmentation: This involves the flexor/tendon of your big toe being used to strengthen or replace the Achilles tendon. This technique is only applied in the case of very advanced inflammation. You will require a cast for a long time following this operation.